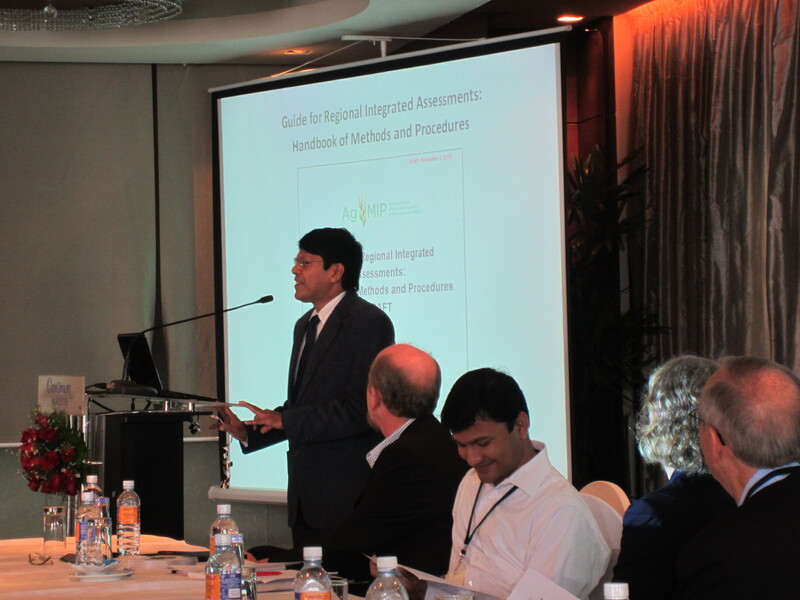 The AgMIP South Asia Kick-off Workshop held at the Cinnamon Lakeside Hotel in Colombo, Sri Lanka November 12-16, 2012. The workshop was organized by SA reional coordination team and by the AgMIP leadership team to help coordinate AgMIP research teams and to help and facilitate compatible integrated regional assessments of climate change impacts and adaption. Build cohesiveness within and among regional AgMIP teams to achieve success across each region. Consider stakeholders concerns and needs. Review and refine protocols for AgMIP regional integrated climate change assessments. Conduct training on AgMIP integrated assessment methods and tools. Develop specific plans for carrying out AgMIP integrated assessments during the project. Develop target publication outputs, including a book, developing a timetable for incrementally writing material such that the assessments are ready for publication by the end of the project. Four South Asia regional teams were participated to the workshop including Sri Lanka, Pakistan, South India and Indogangetic Basin. All the teams were organized prior to this workshop and assembled data and other information needed at the workshop in order to have effective training on different components of the integrated assessment to do the work over the time duration of the project. 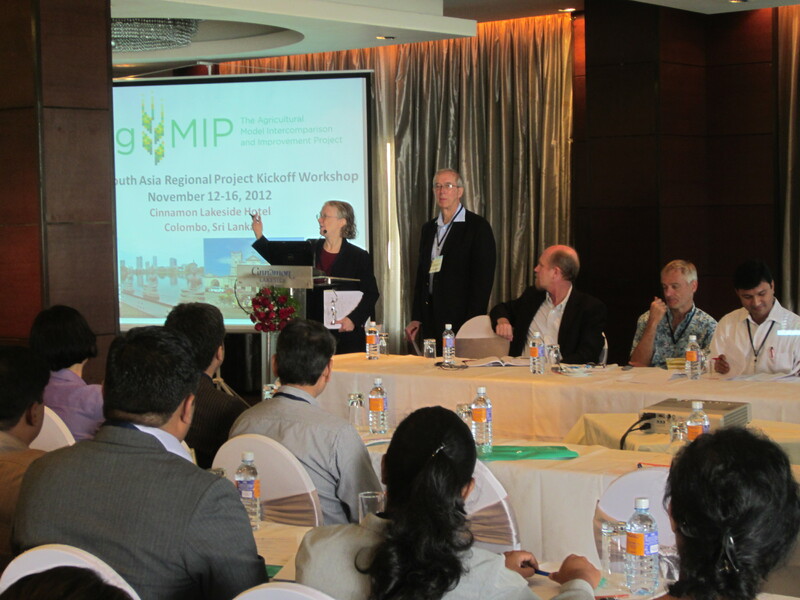 The workshop was included with introductions to AgMIP and Regional teams and their projects, focused discussions on specific project activities with guidance from AgMIP leaders followed by plenary and round-robin breakouts with interactive discussions focusing on each disciplinary activity and overall project integration. Further training on individual components with an emphasis on the integration of climate,crop, economic and IT methods to achieve integrated assessments at each research team was held. In addition effective stakeholder engagement was their. Few important Sri Lankan stakeholders of the project including Additional Secretary of Agriculture Ministry Dr. D.B.T. 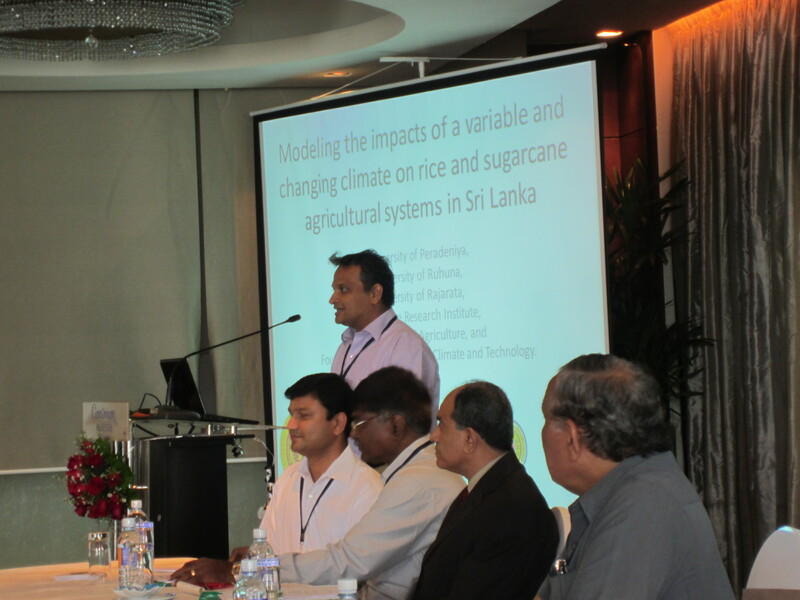 Wijeratne, Chairman of Sugarcane Research institute , Secretary of Environment Ministry were took part in this workshop. Around 23 members of Sri Lanka team were activity participated to the workshop representing different leading partner institutions of the project such as University of Peradeniya, Foundation for Environment, Climate and Technology, University of Ruhuna, Sugarcane research institute, Department of Agriculture and Rajarata University of Sri Lanka.